This entry was posted in Fashion, Religion by Abhi. Bookmark the permalink. The image itself isn’t disrespectful, it’s the images location on a pair of shoes. Showing your feet is generally regarded as a sign of disrespect in Indian culture, so printing this sort of thing on shoes is problematic. While people who aren’t Indian aren’t really obligated to abide by those rules, it’s nice when they show some sensitivity. i guess the litmus test is to swap jesus christ into the situation and see if you’re offended. i could care less personally, but xtians would i think be pretty offended. the main issue is that hinduism is exotic enough that they have a ‘mythology’, not a ‘religion.’ you can co-opt myths into branding pretty easily without consideration of sensitivity cuz everyone agrees it’s made up. not so with religion. I’ve been pushing the “Sai Baba is really Jimi” meme here on SM for many years now. Clearly someone at Converse took it as gospel. Shri Jimi Saheb was also like an Allah. His 40th year (physical) death anniversary was this Saturday. I’m going to pour out some of my Horlicks in His honour. And Sai Baba is a fraudulent poseur who can’t even play a D-chord. He can’t even play an air guitar without getting incontinence. 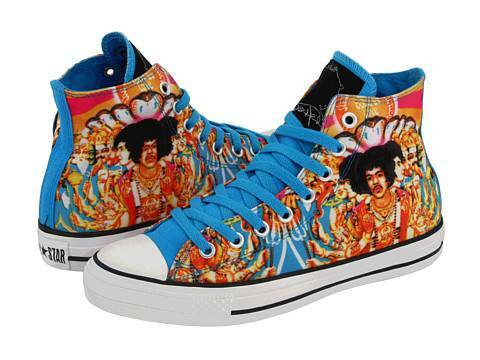 So, does Jimi wear these shoes as he ascends the Stairway to Heaven? i guess the litmus test is to swap jesus christ into the situation and see if you’re offended. I’d go a step further and say swap jesus into a situation that Christians would find offensive such a s toilet bowl with jesus on the receiving end, mouth wide open. I’ve never been religious myself and a few years ago I would happily had donned a pair. But through some re-education I see the points the Hindu groups are making. Have you heard of a 1987 artwork called “Piss Christ” by photographer Andres Serrano? It’s still controversial these many years later. Speaking of artwork, I’m loving the banner art that’s been added to the rotation. And! Lots of love to KXB for all the news postin’. KXB rocks! As for the Jimi-god chucks, the value on the ones that did sell, just went up. Incidentally, the reason for the Axis: Bold as Love cover is also interesting — It had to do with American vs. English culture. When they asked Jimi Hendrix what sort of album cover theme he would prefer, he asked for something to reflect his “Indian heritage” (He was part Cherokee Indian). Unfortunately for him, he was in England, where “Indian” doesn’t mean “Native American”. 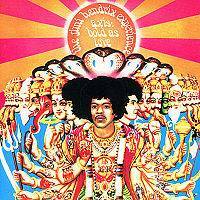 So the designer went to town with his idea of an Indian theme and when Hendrix saw the album cover later, he was a bit confused about it. Unfortunately, it was too late to make changes and so that’s how it was released to the world. I only find it distasteful (not really “disrespectful”) in its use as marketing gimmick. If some random artist went through the trouble of hand painting his/her own shoes in that fashion, I’d actually find it awesome. Regarding the Jeebus- if it were White Jesus, I’d think they were lame. I think the disrespect/or lack thereof is sort of inherent in the design. It may not be malicious per se, but a design like this does imply that these kinds of images/deities are enough of a cheap kitsch that it can go on sneakers, toilets, or whatever else. Its not the kind of thing I’d go out and protest (mainly because I think it is extremely important to keep expression and speech as free as possible), and I think the Rajan Zed types are one too many in this world. However,I’d also be lying if I said that I wouldn’t think that a person who thinks this design is great has a very low opinion of what my beliefs are and images that I consider sacred. But again, if that’s someone’s opinion, then what can I do? To each his own. “MB” props for the info! I’m glad these have been pulled. I do find it offensive, I think as a group Hindus have been way too relaxed about having sacred ties to our religion and being turned into ‘new age’, cutesy fads. in the last category i know plenty of christians, liberal and conserv., who are disgusted by “christian-themed” marketing. in contrast business persons who who are christian capitalists will say stuff like “my product is glorifying the lord!” as an unbeliever it can sometimes leave you confused. I’m not even Christian and I know that you can’t glorify the Lord through service to Mammon. This is, at best, a post hoc rationalization and at worst a cynical ploy to disarm people’s guilt at succumbing to their baser consumerist instincts. Which, I guess is essentially the story of Evangelical Christianity in America.